If you somehow find yourself with a yard full of above ground pool parts, this page may help you decide what to do with them all. Or you may find yourself in need of above ground pool parts to finish the summer project. We may be able to help there also. If you are working on setting up a pool, use this page along with my pool installation page, to help you along. I will also show you how to find those missing parts. For that you could post in the pool parts section of Ask The Pool Pro. Counting the parts to the pool is an important starting place when working with used pools. 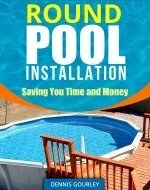 With round pools this is quite easy even if you know nothing about above ground pools. There need to be the same number of uprights, top rails, bottom rails, top plates and foot plates. There should also be the same number of connector caps. As an example a 15' round pool will normally have 10 of each. If you have 10 uprights, 10 bottom rails but only 9 top plates then something is wrong. The only exception to this is in the case of the metal retaining rods that are placed over the coping. Sometimes they are identical to the bottom rails and would have the same count. Other times they are interlocking and would not match the count of the other items. The top rails, or top ledge is the part one might sit on or climb over to get into the pool. These come in different widths from 2" wide to 10" wide. The normal is about 6". 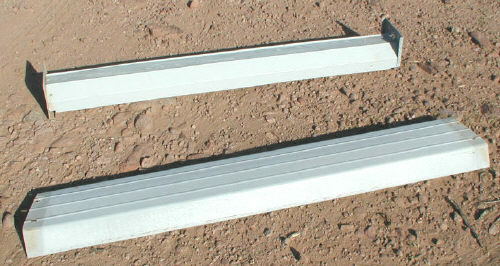 The rail can be steel, aluminum or resin. 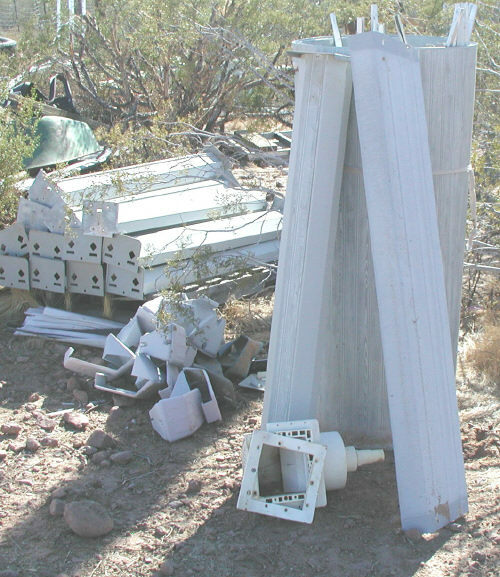 Steel rails can be sanded and painted prior to installation if they look to be in bad shape. Be sure to allow plenty of time for the paint to dry before installing. The point where the top rails meet is covered by a connector cap. The connector caps can be one piece or two and can either snap on or be attached with screws. The uprights connect between the bottom rails and the top rails. Uprights can be one single piece or sometimes three pieces slid together to make a single unit. These are usually made of the same material as the top rails and most often match in color. At the top of the upright a top plate is attached. Top plates will usually attach with two or three screws. These are the pieces the top rails are screwed to and the connector caps also. The top plates can be identical to the foot plates or they can be completely different. On a used pool the tops will be the cleaner of the two sets. The foot plates go at the base of the uprights and are used for connecting the bottom rails. The footplates are the one piece that seems to get the most abuse when a pool is taken apart. Getting the bottom rails out of them without bending them a little is hard. Pliers or channel locks will easily bend them back into shape. Once the bottom rail has been inserted into the foot plate sometimes I give them a little squeeze with the channel locks to keep the rail snug. The bottom rails go around the bottom of the pool connecting at each foot plate and are used to hold the sidewall in place. Bottom rails tend to rust out before most of the other parts and are the most sought after above ground pool part. When connecting the bottom rail make sure to use a tape measure at every foot plate and keep the radius the same all the way around. This can be the most frustrating and difficult part for beginners. An 18' pool would use a 9' radius. If you set everyone at 9', but the last connection is either not enough rail or too much rail, the entire set of rails needs to be shifted to make up the difference. An 18' pool could have a radius of anywhere from 8' 10" to 9' 2". If it needs to be larger or smaller than those guidelines you may have other issues. When replacing bottom rails keep in mind that every size will have a slightly different arc. They will change in many other ways from manufacturer to manufacturer. The side wall is a long roll of steel or aluminum that makes the outside of your pool. Of all the above ground pool parts this is the most important. If it is rusty and full of holes I recommend you do not use it. If rust is seen or repairs are to be made keep in mind that the pressure is greatest near the bottom. Most of the time when a wall blows out it starts near the bottom and works its way up. The other area of concern on a sidewall is the area around the skimmer and return openings. With these being up high on the wall they can always be patched over and new openings cut. When installing an above ground swimming pool it is my opinion that the vinyl liner should come out of a new box. Used liners are more bother than they are usually worth. I go into this more in my pool faq's and my used pools page. Here I will just say you are better off with a new Pool Liner and besides you can always get one of those neat ones with the fish all over it. 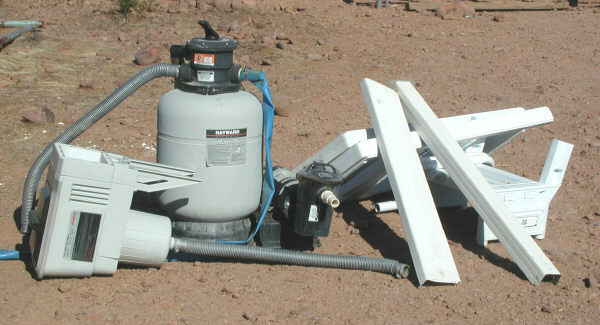 The skimmer attaches to the pool sidewall and is connected to the pump with some type of hose or pipe. The return is much smaller and attaches to the round opening in the wall. The return connects to the filter outlet. When installing skimmers and returns it is best to replace the gaskets. Leaky skimmers or returns can damage a wall very quickly. If you have pool installation questions be sure to visit the pool pro.